IN STOCK FOR A LIMITED TIME! 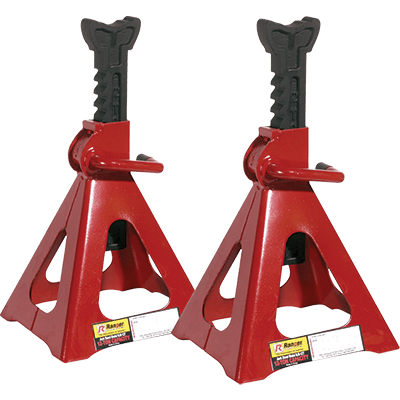 When used together, these heavy-duty jack stands will safely support up to 12 tons. This is the heaviest-duty stand pair we offer, which at 24,000 lbs. is nothing to scoff at. The same safety features and rugged design of our lower-capacity jack stands have been tweaked for super-duty lift applications. The RJS-12T offers an incredible 24,000 lbs. of lift, which puts your lifting and securing abilities with this unit in the realm of dumpster trucks, some city buses, agricultural equipment and more. The 30.5” maximum rise of this jack stand is safe and roomy: work worry-free under a vehicle without feeling cramped or rushed. At Ranger, we understand that lifting heavy-duty vehicles is a completely different task than lifting your average mid-size sedan or sports car. Semi-trucks and other super-duty vehicles require a little more heft from the jack stand in order to be safe. That’s why we increased the base dimensions to a massive 14.5" x 13". There’s no way to overstate the importance of safety when operating under a 24,000-lb. vehicle, so we cut no corners and make no compromises when it comes to your personal safety. We made sure that the additional steel we put into the RJS-12T jack stand was welded to perfection. The base plates were widened by several inches (greatly decreasing the stress on the stand and improving its hold); the ratchet ladder is made rugged enough to easily accommodate the rated vehicle weight; the release handle is virtually stuck in place until the load is lifted; and with 30.5” of max rise, you’re going to be completely happy performing any task you pursue. Our jack stands make wheel service, suspension work, brakes, oil changes, etc. safe and easy to achieve. As long as you choose Ranger, the weight of your vehicle will never define the scope or difficulty of the jobs you’re able perform.